Calls for curricular change in music education abound, but how can we bring this change to our programs, and why is change important? Numerous conferences, publications, and workshops have focused on the inclusion of popular music, vernacular music, progressive methods, and alternative ensembles into the curriculum. More work, however, is needed on exactly how to bring these changes about. 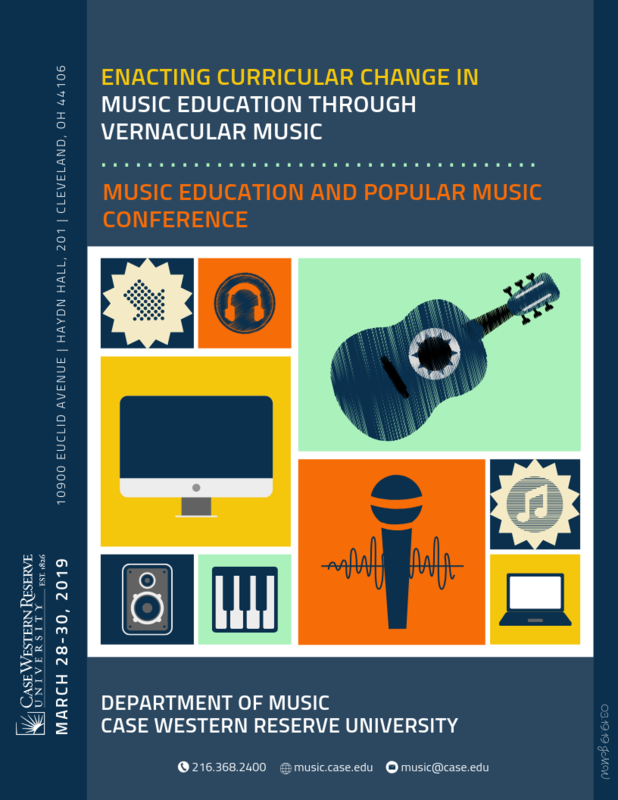 This conference will provide an opportunity for various stakeholders in the music education profession, including community music, to bring together resources from a range of programs, organizations, and experiences. We seek to foster conversation and movement toward curricular change through a focus on how to effect small- and large-scale change within various organizations (e.g., schools, districts, universities, community programs). This conference will feature keynote speakers addressing connections between social justice, inclusion, and curricular change; orchestrating change within organizations; and creating and strengthening school-community partnerships. Other highlights include a reception and social events at local venues, performances by vernacular music groups from area schools, teacher workshops, and presentations by K-12, community, and university music teachers. Registration is available at this link: http://cglink.me/r446958. To register, you will need to create a guest account through the Case Western Reserve University Campus Groups platform, but the process is rather straightforward and takes only a few minutes. After clicking the green button to “Register,” complete the information under “Registration Information” and select account type as “Guest” to begin the process of creating an account and registering. Please note that early bird registration for the entire conference is available until March 1st, 2019, for the price of $75. After March 1st, the registration price will increase to $95. There is also a Saturday only registration available, intended for practicing music educators who are only interested in attending the teaching workshops on Saturday. Undergraduate student registration is being offered at the price of $10 with the hopes of welcoming many pre-service music educators as attendees at this conference. A printable version of the conference program is posted here. The program for the Thursday evening welcome reception at the Rock & Roll Hall of Fame is posted here. University Circle, the location of Case Western Reserve University and the Marriott Courtyard Cleveland University Circle, is a 25-minute drive from Cleveland Hopkins International Airport. There is public transportation available from Cleveland Hopkins International Airport via the RTA, although the journey via public transportation will take at least an hour. You can learn more about the RTA via their website. There are also a variety of taxi and rideshare options available at the Cleveland Hopkins International Airport. Both Lyft and Uber are active in Cleveland. More transportation information can be found on the CWRU website.